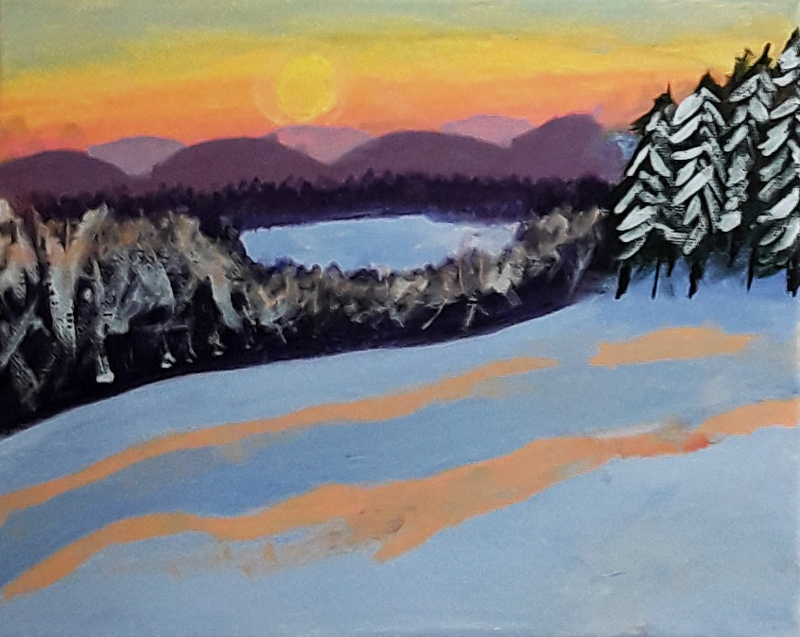 Monson Arts in beautiful Monson, Maine is offering one-week intensive summer workshops. They provide an ideal environment to focus on learning and studio work. Taught by instructors renown in their field, these classes are designed to give participants unhindered time where they don’t have to think about anything other than making. Monson Arts provides all meals and the option of housing right in town within walking distance to all of our facilities. Studios are open 24 hours. Monson Arts is eager to have art teachers participating in their programs and will document workshop hours to support your certification needs. They are offering a 25% discount for workshops to Pisacataquis County residents. 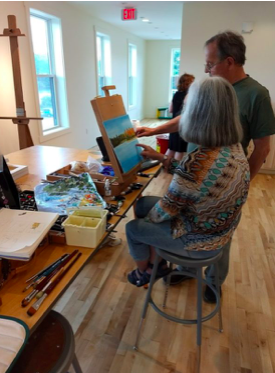 During July and August 2019 Monson Arts will be offering eight workshops in a variety of media from drawing and painting to writing and audio production. A typical workshop includes 10-15 participants and they are able to host two workshops at a time in their facilities. Sessions begin with dinner on Sunday night and conclude with lunch on Friday. Workshops are open to anyone 18 or older and working at any level from beginners to advanced professionals. Enrollment is on a first-come first-served basis. Check out the workshop catalog at THIS LINK for complete details and sign up online. If you have any questions please contact Monson Arts Artistic Director Stuart Kestenbaum at stukestenbaum@gmail.com. To learn more about Monson Arts visit their website. 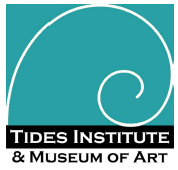 The Tides Institute & Museum of Art (TIMA) in Eastport, Maine is delighted to announce a free professional development opportunity for visual art teachers and other educators on Saturday, April 27 from 9 am to 3 p.m. Sara Egan, School and Youth Programs Manager from the Isabella Stewart Gardner Museum in Boston, will be leading the workshop at the Tides Institute & Museum of Art in Eastport. Thanks to generous support from three private foundations, this workshop is free of charge to participating educators. Contact hours will be provided. The workshop will cover the basics of Visual Thinking Strategies (VTS), which will be an introduction or quick review for those familiar with the educational approach. 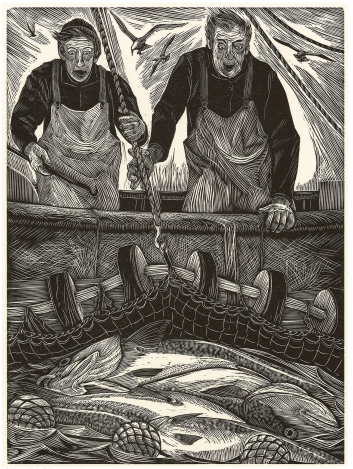 Siri Beckman, “Machias Cod”, wood engraving, 2010. From the collection of the Tides Institute & Museum of Art, Eastport. Teachers will discuss and share ideas about ways to use the recently-published TIMA poster set in classroom settings, including using VTS. Teachers will also learn about ways to partner with the Tides Institute to extend classroom studies on the region’s art and culture, both historical and contemporary, and support student centered learning. Teachers will also learn about outreach opportunities available through the StudioWorks Artist-in-Residence Program. Lunch will be provided, and limited lodging is available for the night before the workshop for those traveling more than 60 miles (one-way) to Eastport. We have workshop space to accommodate up to 25 educators from Washington County for this workshop, but will consider registrations from other counties in Maine and New Brunswick if space allows. To register, or for more information, please contact Kristin McKinlay, Director of Exhibitions & Education, kmckinlay@tidesinstitute.org, or call (207) 853-4047. Jonathan Frost speaking with the 5th graders at his gallery. Their portraits are displayed on the left and bark drawings behind him. Several years ago Nancy Harris Frohlich created LEAPS of IMAGINATION where artists work with students in connecting the environment and history to making art. Much of the work is done through literacy. Recently I visited the Jonathan Frost Gallery in Rockland during a celebration of art created by 5th graders from South School in Rockland. The students worked with teaching artist Susan Bebee and after studying bark created drawings. The drawings were amazing and it was clear that the students will not look at a piece of bark the same way again. I remember when I learned to make rock baskets (forming a basket around a rock, whatever size), I never look at rocks the same way again. Always wondering what shape the basket might be if I used it for a form. The bark drawings were followed by portraits created with a combination of prints and drawings. Students were invited to speak about their artwork and I so enjoyed how articulate they were – they learned so much and were so proud. Thank you Nancy and those who work with LEAPS to provide such rich learning environments for learning in visual arts. Below are some student responses. Tell us Why Art is Important for Kids? Because if you have a job, you need to have IMAGINATION. 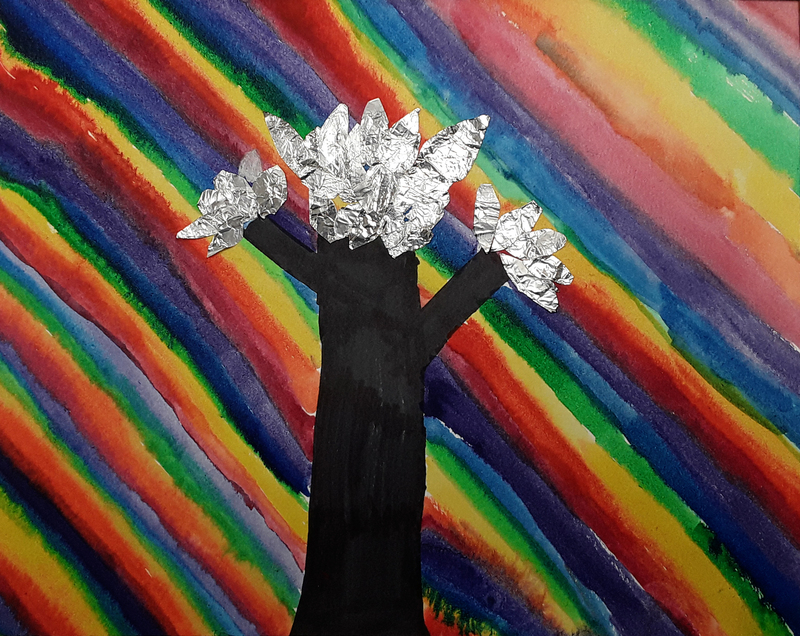 Art helps kids feel INSPIRED. Art is a great way for kids to EXPRESS THEMSELVES. Art lets kids show their FEELINGS. Art helps kids be CREATIVE. Art makes it possible for kids to be ARTISTIC. Art is so important and helps kids CONNECT to NATURE in so many ways. Kids can get BETTER at drawing. 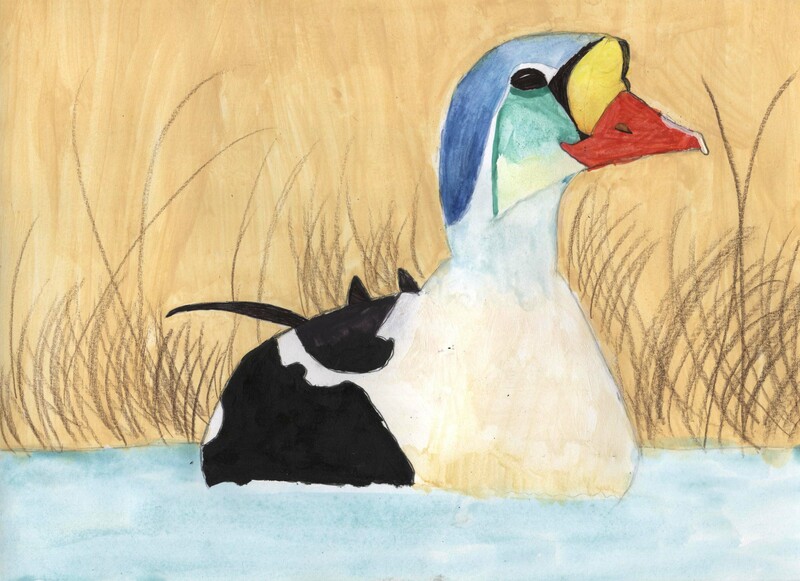 Art helps kids TAKE their MINDS off the REAL WORLD. 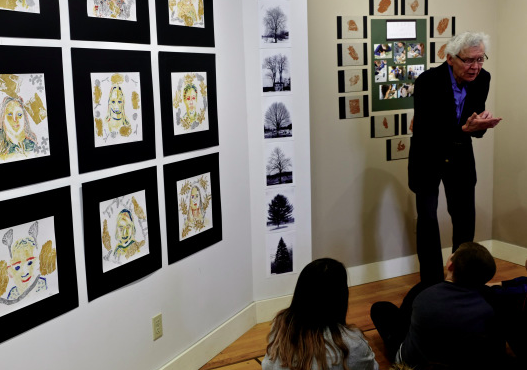 From Tuesday through Thursday, April 16 to 18, 2019, the Farnsworth Art Museum in Rockland will host an art camp for teenagers taught by artist Ingrid Ellison. 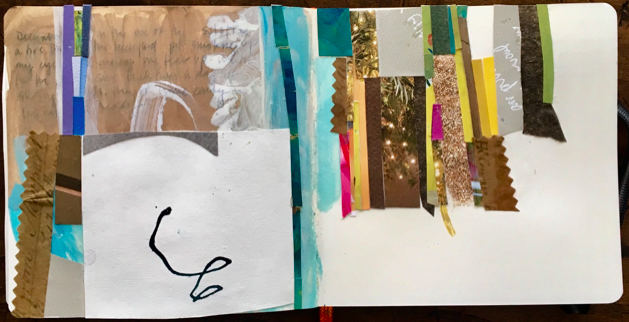 The program, entitled Keeping a Visual Journal—Teen Edition, will take place at the Gamble Education Center, at the corner of Union and Grace Streets in Rockland, from 10 a.m. to 2 p.m. each day. Journals provide a space to reflect, observe, dream, and rant in a truly personal creative space—the painted page. The nature of keeping a journal is perfect for discovering new forms of expression both through content and materials. From collecting to collaging, drawing to doodling, creating secret envelopes to writing prompts, the Farnsworth Art Museum’s three-day workshop led by artist Ingrid Ellison will introduce teenagers to a variety of art materials and processes both traditional and unconventional for capturing daily inspiration on a painted page. Class time will include lots of demonstrations, inspiration, prompts, and time for snack breaks and optional sharing. Please bring a bag lunch. Ingrid Ellison is a painter and art instructor working in oil, mixed media, and printmaking. She is a graduate of Skidmore College and earned her MFA from American University. Since moving to Maine in 2007, Ellison has exhibited at the Center for Maine Contemporary Art, Åarhus Gallery, the University of Maine–Bangor, and the Cynthia Winings Gallery. She has a passion for sharing what she does with a greater community and makes connections with both school-aged and adult students. The fee for this class is $90, plus a $5 materials fee payable to the instructor. Partial scholarships are available; please inquire at education@farnsworthmuseum.org. For more information or to register, please visit www.farnsworthmuseum.org. Student opportunity to design an Maine Learning Technology Initiative T-shirt. A panel of judges will narrow the list to five possible options and then will encourage other students to vote to pick the winner. Up to twenty (20) students will also win free registration to the conference, May 23, UMaine campus. Eligibility requirements, submission guidelines, judging criteria, and the competition timeline can be FOUND HERE. To submit entries, please use THIS FORM.